Together with the Admin pages in Elvis Server, the Management Console is used for setting up and managing parts of the Elvis 5 environment. 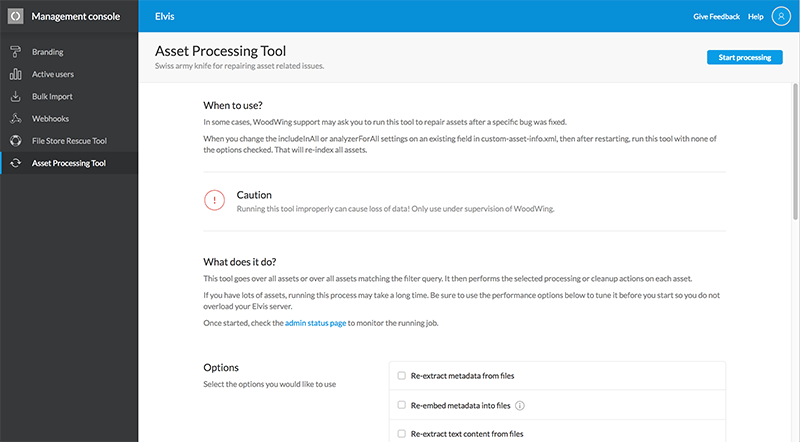 This article provides information about how to access the Management Console and gives a short overview of each task. Using the Branding page, the look and feel of the Pro client and the Brand portal can be changed to match the style of the brand that the Pro client and Brand portal is used for, for example by matching it with the branding of a company, product or publication. 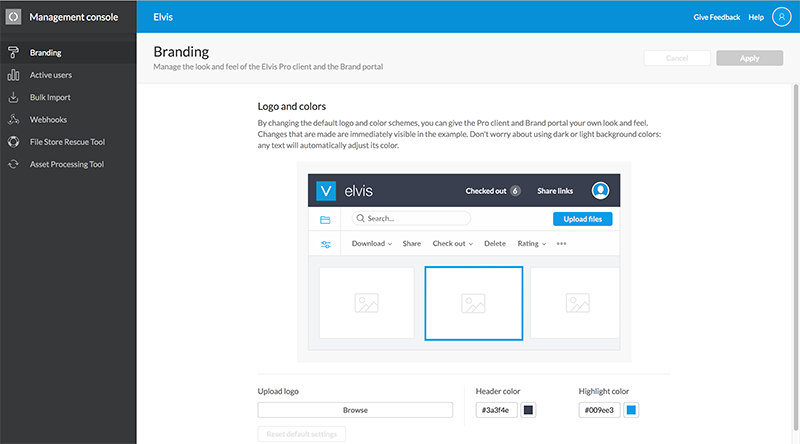 For more information, see Setting up the Pro client in Elvis 5. 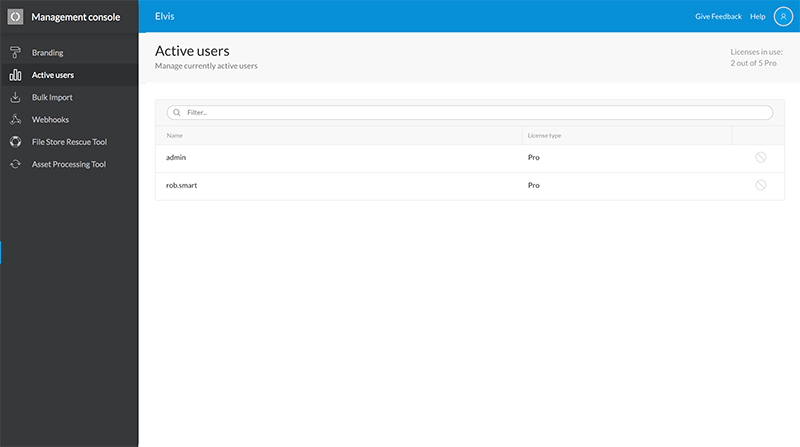 The Active Users page provides an overview of all users who are currently logged in to Elvis Server. When needed, users can be disconnected (for example users who have forgotten to log out and who are taking up a license which is preventing another user from logging in). For more information, see Disconnecting users from Elvis 5 Server. A bulk import of assets into Elvis is typically done when the system has just been set up and assets need to be moved from your existing file store location(s) into Elvis. This will also be a good moment to analyze the assets that have accumulated in your file store and to exclude unwanted files from the import to ensure an Elvis system that is as clean as possible. One of the ways of importing files in bulk into Elvis 5 is to use the Bulk Import tool in the Management Console. It imports large numbers of assets from an existing file storage, including from Amazon S3. Assets are either moved or copied and the folder structure of the original file store in retained. For more information, see Importing files in bulk using the Import tool of the Elvis Management Console. 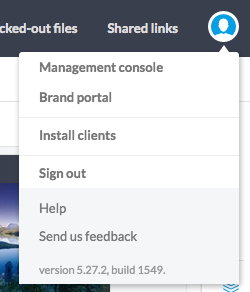 Managing Webhooks is done on the Webhooks page. For more information, see Working with Webhooks in Elvis 5. After restoring an index backup, the file store and index might not be synchronized. This is especially the case when only a slightly older version of the index is restored instead of restoring a matching backup of the file store. The File Store Rescue Tool can then be used to validate that the file store and index are synchronized. For more information, see Rescuing lost index entries for assets in the File Store folder of Elvis 5 Server. Such issues can be fixed by running the Asset Processing Tool. For more information, see Repairing assets in Elvis 5.